Fill your toolbox with the best tools for DIY projects around the house! 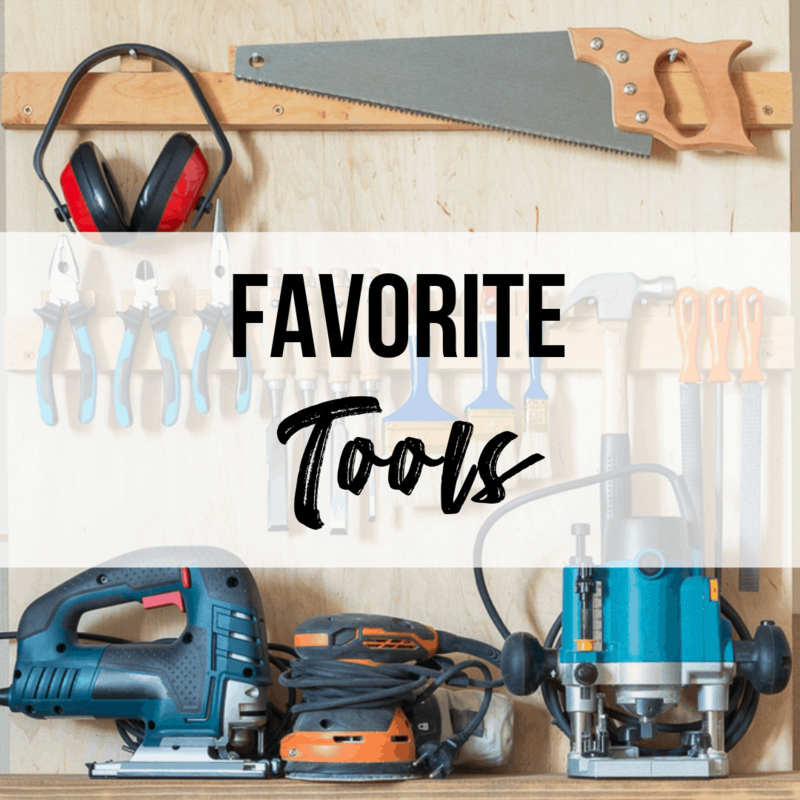 From hand tools to power tools to handy gadgets, you’ll find my favorites here! Over the years, I’ve amassed quite a collection of tools in the workshop! I always start off with an inexpensive basic model (I’m a huge fan of Ryobi for this), then upgrade when I decide the additional features or higher quality tools are worth the money (yes, Festool and SawStop products are worth the money!) I always sell the old tools on Craigslist to recoup some of my investment. If you’re just starting out, I suggest you check out my post of the best woodworking tools for beginners. In that tutorial, I go more in-depth and explain what each tool is used for and why I recommend that particular model. I have personally used or own each of the tools on this list, and highly recommend them. If you purchase any of these tools through my links, I may earn a small commission at no additional cost to you. Thank you for supporting The Handyman’s Daughter! One of the most used tools in the workshop! Add a miter saw stop track to your miter saw stand for the best results. To tame all that sawdust, check out this collection of miter saw dust collection ideas, or make your own miter saw dust hood! Yes, a SawStop is expensive, but it’s much cheaper than reattaching a finger! The table saw is one of the most dangerous tools in the workshop, and the SawStop gives me peace of mind. This jobsite model comes with a stand that you can wheel around the shop, and folds up when you’re not using it. I always thought a sander was a sander until I received the Festool sander for Christmas one year. Game changer! This baby gets your project surface smooth as silk! I also like this cheaper one that has great dust collection. I have a whole stable of Ryobi drills in their own cordless drill storage rack. I’ve totally abused them over the years, and they can take a beating and keep on going! A cordless jigsaw makes life so much easier! No more worrying about accidentally cutting through the cord or getting it caught on the edge of your project. I plan to upgrade mine soon, so I’ll update this when I decide what to get! I very rarely use a circular saw now that I have a track saw, so it just sits in its circular saw stand most of the time. But it’s a great starter tool! This little router is great for rounding over edges like on this DIY cutting board. This Makita router currently lives in my benchtop router table and doesn’t get bogged down by anything! Sometimes Harbor Freight is the way to go! Handy to have, but not required for most woodworking projects. I don’t use a scroll saw as much as I should, but this is a great starter model. Take a look on Craigslist for used Festool track saws. I got mine for a steal! Track saws are great for cutting down larger sheets of plywood with greater accuracy than a circular saw. I started out with the huge Harbor Freight dust collector with a Wynn filter, but it wasn’t working out in such a small space. This smaller one mounts to the wall and has great suction! I’ve tiled two bathrooms with this tile saw (a full bathroom remodel and a half bathroom makeover), and it still works great! Cuts up to 20″ tiles, which is an important feature with today’s larger format tiles being so popular! This is probably one of my favorite tools in the workshop! No air compressor necessary for this nail gun! I use the K5 for 95% of my pocket holes, but still have the R3 for occasional projects. Check out my post comparing the Kreg Jig R3 and K5 to see which one is right for you! This clamp keeps two pieces aligned at a 90 degree angle while you screw them together. If you build anything with pocket holes, you need this! I’m currently in the process of upgrading all my Harbor Freight bar clamps to Bessey clamps. You can never have enough clamps, and these are the best! If you’re planning to build any kind of cabinetry, these corner clamps are like another set of hands! They keep panels at a perfect 90 degree angle so you can get square cabinets every time! Every once in a while, the nail gun won’t shoot a brad all the way under the surface of the wood. That’s when you need a set of these! Save yourself the agony of hand sanding with this ergonomic sanding block shaped like a computer mouse! Sometimes a paint brush just don’t do! Get a flawless finish with this paint sprayer. This stubby little paint brush is my go-to for all my painting projects! It fits comfortably in your hand and doesn’t have a long handle to get in the way. This is the pair I use, but I have an entire post on the best safety glasses for woodworkers to help you find the perfect ones for you! Nothing makes a long sanding session more bearable than your favorite music pumped into these Bluetooth hearing protection muffs! Check out more ear protection options here. RZ masks are more comfortable than those paper things, and do a better job filtering out all that sawdust you’re making! Woodpecker squares are the best of the best and always accurate, but they’re pricey! I also like the Kreg Multi Mark for more versatility. I keep a half dozen tape measures throughout the house, so I always have one within arm’s reach! I’ve worked with Ryobi Outdoor for several years now, and all their landscaping tools are top notch! I especially love the 40V Expand-it system, which makes it easy to switch between tools with the same battery and handle. All the attachments hang in this easy-to-make garden tool storage rack with a shelf for battery chargers and string reels! This baby is a game changer! It runs on 40V batteries, and I can mow our entire front and back yard on a single charge. And it folds up to the size of a suitcase to take up less space in the garage! Check out my full review of this lawn mower here. Cleans up the edge of your lawn and makes it look immaculate! Forget about mixing in compost and other garden additives with a shovel! Stick this cultivator on the end of your Expand-it handle and watch it churn through soil with ease. A battery powered chain saw at the end of a pole? Sounds crazy, but it’s really easy to use and takes down high branches like a champ! Part of the Ryobi Expand-it system. Switch from the edger to the pole saw to the leaf blower with just one battery and handle! You can see how this leaf blower handles heavy fall leaves in this post. I’ve had several power washers die on me over the years, but this one has been passed around the neighborhood and keeps going! A battery powered chemical sprayer might sound like overkill, until you’re pumping the handle of your manual one for the thousandth time while cleaning your deck! I’m sure I’ve forgotten something, so if you’re wondering about any tools that aren’t on this list, feel free to shoot me an email at hello [at] the handymans daughter [dot] com! I’d be happy to give you my recommendations, and I’ll add it to my list!